If you've noticed your dashboard looking a little sparse of late this could very well be the reason. Please click here to be reacquainted with all of your favourite beautys and blogs and maybe even find one or two wonderful new ladies to follow. As always, there's plenty of other ways to get your fill of fabulous. 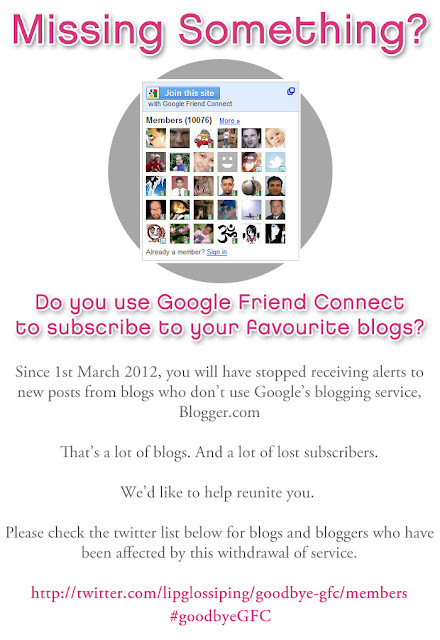 Bloglovin, HelloCotton and Bloggers.com are a couple of my favourites but the options are virtually endless. Are you a non Blogger Blog? Have you noticed a difference since the demise of GFC? All of this looks like Russian to me. Haven't a clue what you're on about. Dashboards - outside of cars?!!!!! Hey, will do. Thanks for visiting!